This atomizer is designed for VapeOnly Smooth MOD, which has 2ml capacity and the typical adjustable top airflow design as many e-cig tanks. This atomizer is designed for VapeOnly Smooth MOD, which has 2ml capacity and the typical adjustable top airflow design as many e-cig tanks. But you'll see its shining point lies at the 0.8ohm KA1 coil, which is designed to offer vapors great flavor. • You can also buy Smooth Kit, Smooth atomizer and Smooth Coil in BB. 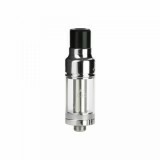 • Empty atomizer, you need to buy the e-juice separately. I am a fun of Vapeonly and they have little mod. Have buy this Smooth Kit to try it out.